In the different parts that comprise this large dossier of information, we will attempt to demonstrate that the Tarot de Marseille is at the origin of almost all the Tarots of Europe; that it has existed since well before 1700, and that it is, among others, the agent of preserving the culture of the Master Builders and the Golden Section in a manner unique in Europe. It is important to keep in mind that the Master Cartiers of Marseilles had a glorious reputation, well before the beginning of the 18th century, for making since time immemorial the best cards in the world. Others maintain that the origin of Tarot is undoubtedly Egyptian, still others that it was a legacy left by the Cathars… So, how can we truly know? So let us take an early Tarot de Marseille, whose most representative example is that of Nicolas Conver (1760). It is the only Tarot of Europe which contains, in the whole of its cards, the characteristic geometrical constructions that scrupulously respect techniques specific to the Roman Master-builders (the cathedral builders). This sacred geometry utilizes a particular number, phi = 1,618, called the Golden Section, and which was found in the architectural study of the pyramid of Cheops. 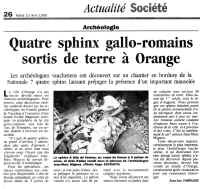 Similarly, a recent archaeological discovery from April 9, 1999 in Orange, France, of an important mausoleum from the 1st century C.E., which proves in an undeniable way that the winged sphinx, which we find in The Wheel of Fortune (Card X of the Tarot de Marseille) formed an integral part of the worships practised in Marseilles and its vicinity. There also exist other subtle encodings, which form a coherent whole in the old Tarots de Marseille. These extremely complex encodings interconnect the whole of the cards as well by colour as by symbol. They are not found in the other old Tarots. the Tarot de Marseille at its origin is the only Tarot in the world which contains in the whole of its cards the geometrical structure of the Golden Section specific to the Roman Master-builders (the cathedral builders). 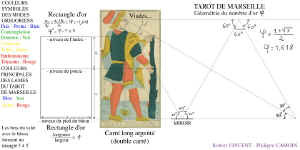 this geometrical structure forms an integral part of the positions of the figures and objects to a degree that it is clear that that it was in the Tarot de Marseille right from the beginning, and that it could not have been added to a more simplistic deck that had come from another country, for example. there existed in Marseilles and its surroundings very old cults, in which one finds in the iconography of the Tarot de Marseille without having to go to seek them in Egypt. We have the example of the winged sphinx, which anyway does not exist in Egypt. thus there would have been in Marseilles and its surroundings an authentic initiatory tradition which would have drawn a part of its sources from Egypt, but which was fully adapted and integrated into the Western civilization previous to ours. It was reflected and naturally conveyed in the cultural practices of the time through the Tarot de Marseille: a perfect medium and vehicle for a uniform and single Initiatory Tradition in Europe. the Tarot de Marseille is the ancestor of all the Tarots of Europe.